"It is a South Indian dessert. Very rich and delicious. Best after any spicy meal. 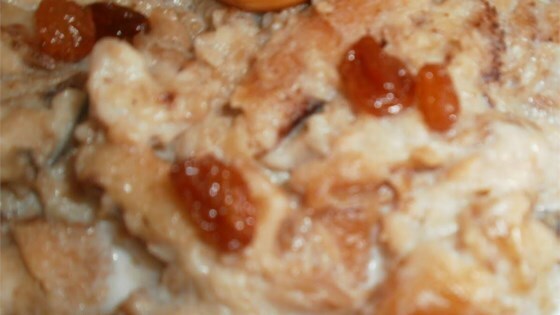 Prepared on special occasions, it has always been favorite dessert in my family. Serve warm or chilled." Place bread triangles onto a baking sheet and toast in the preheated oven until lightly browned and dry, about 5 minutes per side. Heat vegetable oil in a large skillet over medium heat. Fry bread triangles, working in batches, until golden brown, 2 to 4 minutes. Remove bread with a slotted spoon and drain on a paper towel-lined plate. Whisk sugar, water, and cardamom together in a saucepan; cook over medium heat until syrup has reduced slightly, 10 to 15 minutes. Dip bread triangles into syrup until fully soaked and transfer to a plate. Simmer milk in a heavy-bottomed saucepan over medium-low heat. Transfer soaked bread triangles to the simmering milk; cook over low heat until the milk is absorbed into the bread and the fat separates, 10 to 15 minutes. Stir in raisins. Garnish with almonds and cashews. You can also leave bread slices on a tray to dry for 12 hours instead of toasting in the oven.